CHELSEA — The blocks between Sixth and Eighth avenues in eastern Chelsea may utterly lack park space, but slip behind one set of glass doors, and you'll find a forest in miniature. 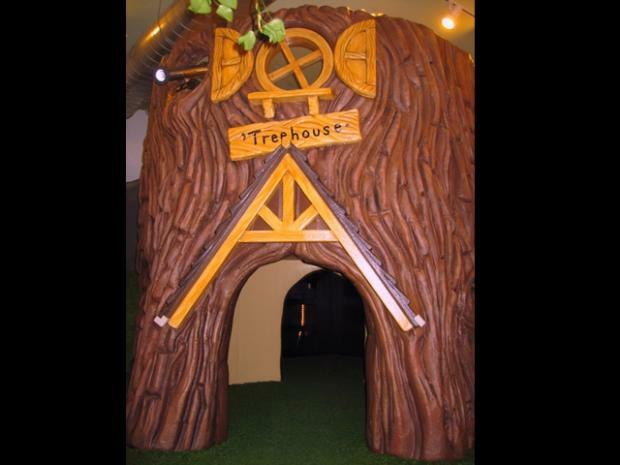 City Treehouse, located at 129 W. 20th St., is the three-year-old brainchild of one Manhattan mother who grew tired of the lack of diversity in play opportunities for her young twin daughters. Sydney Price, a former software developer, recalls thinking "Ah, this is ridiculous, there's nowhere to take them!" "If you think back to what was your favorite activity as a kid, for me it was building hideouts," she added. So in order to recreate her own experience as a child in Indiana, Price drew on the business lessons of her restaurateur parents to found the indoor play space, located almost directly across the street from the parking lot that has sparked a battle between parks and affordable housing advocates (Price supports a park). Now, kids from Chelsea and across the city can come to climb, crawl and splash around. A first trial visit costs $10, and unlimited monthly memberships are $175. Families can come on a per day basis or reserve the space for birthday parties ($300-$1200, depending on the terms). One frequent treehouse-goer is Paulina Cooper, a nanny who brought three-year-old Luke from the Village in on Wednesday. His favorite activities, she said, include pretending to look for pirates from the window on the two-story treehouse's second floor. "We love this place," she said, praising City Treehouse's staff. "Especially when it's cold and rainy, it's awesome." Other than the treehouse itself — which features a slide, star cave and astroturf floor — Price is particularly proud of her "Splash!" water play area. Here, a series of dams, fountains, waterwheels and toy animals allow kids to experiment and strengthen motor skills and get a basic grasp of concepts like cause and effect. But beyond the educational aims, she said her goals are also to just help harried, multitasking parents such as herself feel a little more calm. "Parenting is really tough," Price said. "If I can make a parent relax just a little bit, it's very rewarding."